Is This Outfit Gray And Teal Or Pink And White? Another picture to mess with our minds! What do you see? Remember “The Dress” from last year? You know, the photo that had people all over the world debating whether a dress was gold and white or blue and black? Well, a new eye-tricking picture of a sportswear outfit has people taking sides once again! Apparently, many people saw something completely different in that picture. In fact, a large number of commenters insisted the outfit looks gray and teal. Or, gray and mint green. And, once more the internet has been launched into a color war! Some users thought using technology would settle the issue once and for all. That picture doesn’t look the same as the original post, though. So, I’m not sure it solves the dilemma. But, for the most part, people just can’t believe one picture looks so different to others, even in their own family. So, what causes these debates—other than that they’re kind of a fun distraction for the day? Is one half of the internet color blind? Perhaps a trick of the camera? Believe it or not, science does have an explanation. Even outside of vision scientists, most people just assume everyone sees the world in the same way. Which is why it’s awkward when disagreements arise—it suggests one party either is ignorant, is malicious, has an agenda, or is crazy. 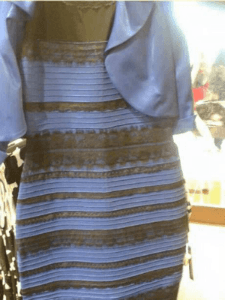 We believe what we see with our own eyes more than almost anything else, which may explain the feuds that occurred when “the dress” first struck and science lacked a clear explanation for what was happening. So, what affects how we see things, such as color? Wallisch said scientists continue to look at the science behind the dress phenomenon. One major factor is how lighting changes our perception. In other words, shadows can affect the way our eyes and brain interpret color. Our sight also depends a lot on our previous experiences. How we’ve seen things before can influence what we see now. And, since everyone has a different visual history, everyone has their own way of seeing things. Crazy, huh? So, What Color Is The Nike Outfit, Really? (In case you’re curious, they have the outfit on backorder and it runs $120). Despite the post, the debate seems to go on. The photo continues to go viral with thousands of shares on social media. So, what do you think? What color is it? SHARE Is This Outfit Gray And Teal Or Pink And White?